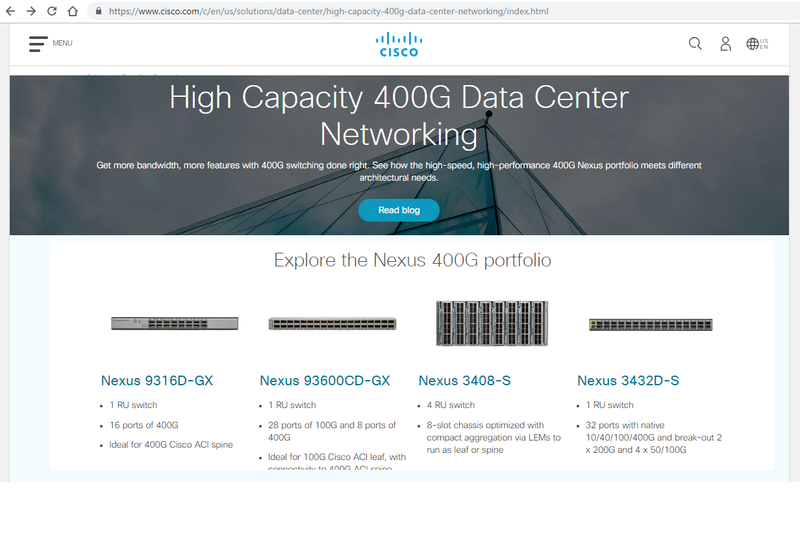 Cisco launched its portfolio of Nexus 400 Gigabit Ethernet (400G) switches for large cloud data centers. Field testing is expected in December and general availabity is targeted for the first half of 2019. Cisco is supporting QSFP-DD (Quad Small Form Factor – Double Density) modules as "the ideal 400G connectivity option: for all next-generation cloud and other hyperscaledata centers. Cisco said it is also working to take BiDirectional (BiDi) Optical Networking to the 400 Gigabit Ethernet realm, enabling re-use of existing fiber cabling infrastructure when upgrading to higher speed interfaces. Several models are initially offered. 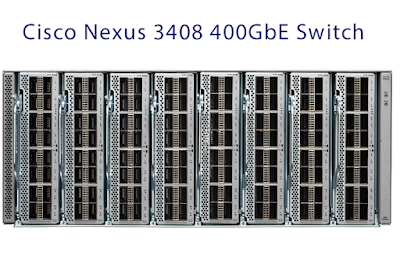 Cisco Nexus 3400-S -- a 400G programmable switch with 50 Gbps PAM4 Serial-Deserializers (SerDes). It leverages a 12.8-Tbps ASIC for 32 ports of 400G using Quad Small Form-Factor Pluggable – Double Density (QSFP-DD) modules that are backward-compatible with QSFP+, QSFP28, and QSFP56. The Cisco Nexus 3432D-S supports break out for 2x200/50G, 4x100/50G/25G, and 8x50G, supporting up to 128 ports of 100G or up to 168 ports of 50G. 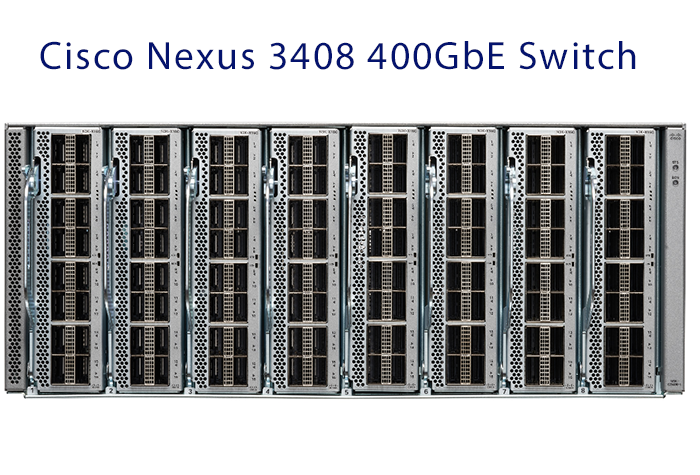 At 400G, the Cisco Nexus 3400-S claims the lowest latency in the industry, of 370ns at high-power efficiency. Cisco Nexus 9300-GX switches, also part of the fixed Cisco Nexus 9000 Series Switches series, offers 16 x 400/100-Gbps QSFP-DD ports or 28 x 100/40-Gbps Quad Small Form-Factor Pluggable (QSFP28) and 8 x 400/100-Gbps QSFP-DD ports. The platform introduces a fully backward-compatible 400G optical interface Quad Small Form-Factor Pluggable – Double Density (QSFP-DD) to transparently migrate existing data center fabrics from 40-Gbps and 100-Gbps speeds to 400 Gbps. The platform provides investment protection for customers, delivering highly flexible layer 2 and layer 3 scalability, and performance to meet the changing needs of virtualized data centers and automated cloud environments. Cisco provides two modes of operation for Cisco Nexus 9000 Series Switches. Organizations can deploy Cisco Application Centric Infrastructure (Cisco ACI) or Cisco Nexus switch environments (Cisco NX-OS mode). 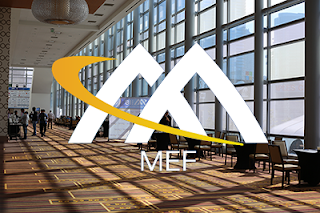 The MEF18 event in Los Angeles revealed the progress of the industry in implementing the MEF 3.0 global services framework, which was launched a year ago, says Mike Strople, Managing Director at Zayo and Chairman of MEF. 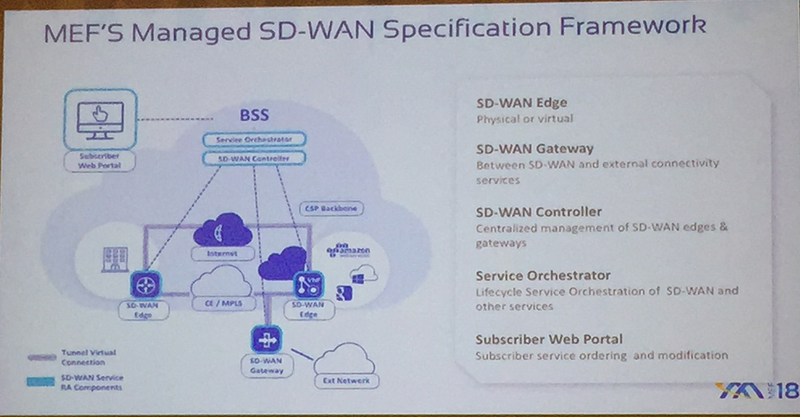 In particular, it is exciting to see the LSO Sonata APIs and SDK, as well as progress with SD-WAN. Netronome unveiled its open architecture for domain-specific accelerators . Netronome is collaborating with six leading silicon companies, Achronix, GLOBALFOUNDRIES, Kandou, NXP, Sarcina and SiFive, to develop this open architecture and related specifications for developing chiplets that promise to reduce silicon development and manufacturing costs. The idea is fo chiplet-based silicon to be composed using best-of-breed components such as processors, accelerators, and memory and I/O peripherals using optimal process nodes. The open architecture will provide a complete stack of components (known good die, packaging, interconnect network, software integration stack) that lowers the hardware and software costs of developing and deploying domain-specific accelerator solutions. Implementing open specifications contributed by participating companies, any vendor’s silicon die can become a building block that can be utilized in a chiplet-based SoC design. Wave Computing outlined its strategy for an AI-enabled MIPS offering and ecosystem. The company announced a new AI-enabled licensing roadmap and a broader 3rd party ecosystem. The company said it will pursue a multi-pronged strategy to enable new use cases for AI based on MIPS architecture. “Wave Computing’s MIPS technology is a key component of the Data Processing Unit we are developing as a fundamental new building block of next-generation data centers. We expect Fungible’s solution to be pivotal in powering modern data-centric applications such as AI and analytics” says, Pradeep Sindhu, CEO of Fungible, Inc.
“We are well underway in executing on our strategy to bring AI to All. This means delivering AI computing systems for datacenter and customer premise applications, licensable solutions for next-generation SoCs and AI application software for end customers in multiple markets. Since acquiring MIPS in June, we have been blown away by the overwhelmingly positive responses by customers and partners. This underscores the tremendous market opportunity for a common, AI-based development environment and associated suite of solutions. 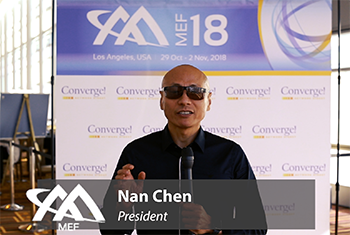 We’ve never been more optimistic on the value MIPS offers, and look forward to extending the market share of MIPS-based designs by enabling native AI performance for edge SoCs,” said Derek Meyer, CEO of Wave Computing. Under the plan, the company is expanding its IP team globally, including hardware, software, marketing and sales staff. It continues to invest in its 64-bit, scalable multi-threaded MIPS technology roadmap for embedded applications. Wave Computing will offer new solutions ranging from CPU cores for edge applications to more robust implementations for emerging AI training and inferencing applications. Wave is also addressing the future of functional safety in autonomous vehicles by building on its ISO26262 certification and introducing advanced lock-step functionality for its MIPS cores. 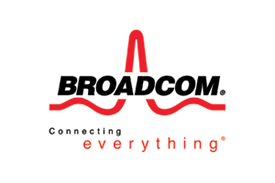 In August, Wave Computing announced a strategic partnership with Broadcom to bring its dataflow processing unit (DPU) to market at the leading-edge 7nm process node. Specifically, Wave will leverage Broadcom’s design platform, productization skills, and 7nm 56Gbps and 112Gbps SerDes. The device will be fabbed using TSMC's 7nm process. In June, Wave Computingacquired MIPS Tech, Inc. (formerly MIPS Technologies), a global leader in RISC processor Intellectual Property (IP) and licensable CPU cores. Researchers at Caltech are experimenting with metasurface optics to bend and focus light in a finely controllable way by using carefully designed microscopic structures on an otherwise flat surface. In a paper published by Nature Communications on October 10, the researchers describe a technology called "folded metasurface optics," which is a way of printing multiple types of metasurfaces onto either side of a substrate, like glass. 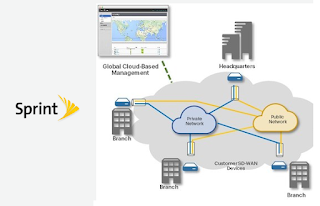 Sprint announed the worldwide expansion of its Software Defined Wide Area Network (SD-WAN) services worldwide. 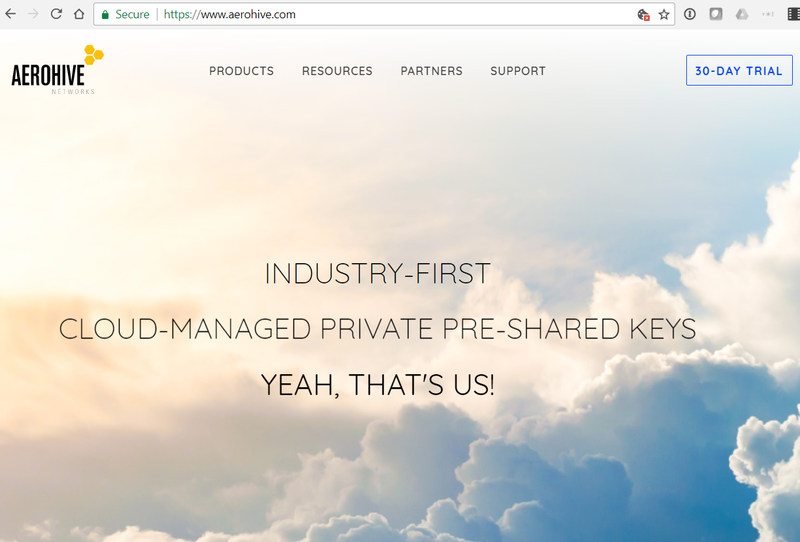 Aerohive Networks reported total revenue for the third quarter of fiscal year 2018 of $40.6 million, compared with $39.3 million for the third quarter of 2017. Subscription and support revenue was $11.7 million, or 29% of total revenue, for the third quarter of fiscal year 2018, compared with $10.1 million, or 26% of total revenue, for the third quarter of 2017. On a GAAP basis, net loss was $2.4 million for the third quarter of fiscal year 2018, compared with a net loss of $5.1 million for the third quarter of 2017. GAAP gross margin was 65.6% for the third quarter of fiscal year 2018, compared with 66.6% for the third quarter of 2017. On a non-GAAP basis, net income was $1.5 million for the third quarter of fiscal year 2018, compared with a net loss of $0.1 million for the third quarter of 2017. Non-GAAP gross margin was 66.1% for the third quarter of fiscal year 2018, compared with 67.5% for the third quarter of 2017. EKINOPS introduced its OneAccess 10G Ethernet Access Device (EAD) for high-speed Ethernet services to Enterprise and wholesale customers. The OneAccess 1651 EAD, which will be commercially available in Q1 2019, will enable operators to monitor thousands of Ethernet links centrally and generate service activation birth certificates without the need for deploying test equipment at the customer site. EKINOPS said its new OneAccess 1651 EAD also enhances the L2 aggregation capabilities in optical transport deployments. The new combined solution draws on Ethernet packet multiplexing and grooming, enabling operators to transport Ethernet connections in a more efficient and flexible way over the optical network. 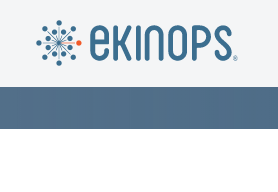 This innovative pairing is the first joint development project by Ekinops’ Access and Optical Transport business lines. 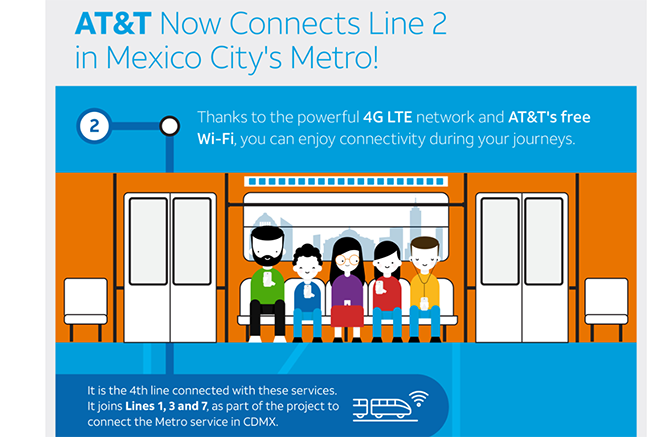 AT&T has activated its LTE network in Line 2 of the Mexico City Metro, bringing connectivity to more than 800,000 daily users of this route. AT&T has also enabled free Wi-Fi in all 24 stations of the route. Line 2 is the 4th connected line by the company as part of the Mexico City Metro connectivity project to help reduce the digital gap in the country. Line 2 is on average 6 meters deep. It runs from Cuatro Caminos to Tasqueña, and it has 24 stations; 14 of them are underground and 10 above ground. In addition, this line has some emblematic stations that go through Mexico City’s Historical Downtown, such as Hidalgo, Bellas Artes and Zócalo. MEF released four LSO (Lifecycle Service Orchestration) Sonata API technical specifications and Software Development Kits (SDKs) for inter-provider orchestration of current and emerging MEF 3.0 services (e.g., Carrier Ethernet, IP, SD-WAN, Optical Transport, security, and other virtualized services). 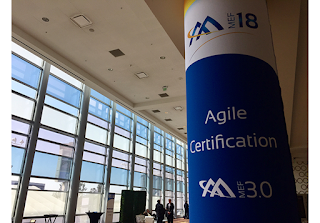 MEF notes that more than 40 service and technology companies have contributed to or supported the MEF LSO Sonata standardization and certification effort, participated in MEF 3.0 LSO Sonata implementation work, and/or participated in the LSO Sonata-related PoCs at MEF18. 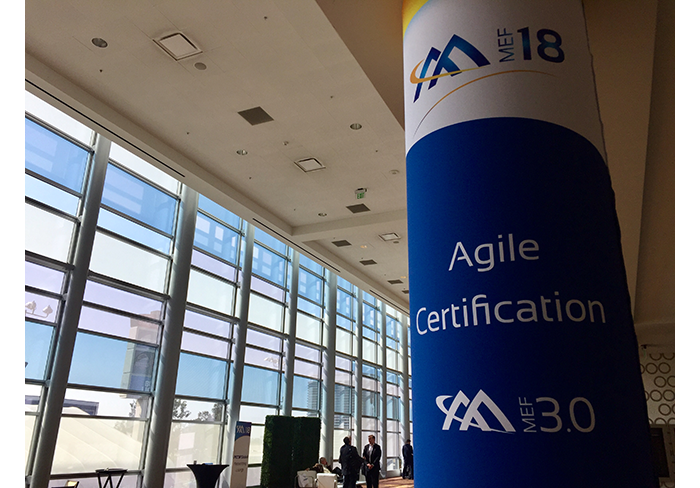 In addition, the MEF 3.0 certification program for service providers and technology solution providers will be expanded on a pilot basis in 1Q 2019 to include cloud-based testing of LSO APIs, beginning with certification of LSO Sonata APIs for serviceability, product inventory, quoting, and ordering. Nokia introduced its WaveSuite software for optimizing and virtualizing the optical networks of service providers, wholesalers, and large enterprises. Nokia describes WaveSuite as a new breed of intelligent software applications driven by real-world use cases. 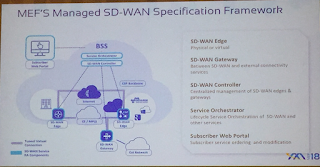 Sam Bucci, head of optical networks for Nokia, said: “As part of Nokia’s already rich portfolio of network software, WaveSuite applications provide the tools operators need to accelerate their business transformation. These innovations are the result of years of working closely with our customers to address all aspects of optical networking with open applications enhancing not just operations, but opening up new services and business models. 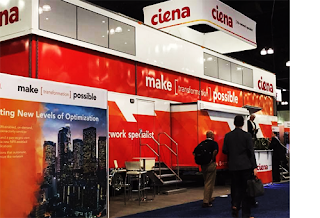 Ciena is launching a cloud-based analytics-as-a-service offering to help network providers translate network performance data into actionable insights. 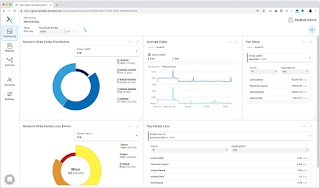 Ciena said its Insights Service, which builds on its existing consulting practice, consolidates a wide array of analytics-based capabilities into a single, multi-tiered service offering designed to ensure networks are securely “fit for flexibility” today and into the future. “Our holistic analytics approach enables a smooth transition path for network providers to evolve toward building more adaptive networks. Each customer’s analytics needs are unique in this journey. We’ve designed our Analytics portfolio so customers can easily choose and deploy the analytics services and/or software applications that best meet their needs today, while gaining the flexibility to add capabilities as their analytics strategy evolves,” stated Ricardo Warfield, Vice President of Global Services, Ciena. T-Mobile received a written consent of Deutsche Telekom Holding B.V., holder of approximately 63.5% of T-Mobile Common Stock, in favor of the Sprint transaction. Regulatory approvals are still pending. T-Mobile expects the deal will be completed in the first half of 2019. A10 Networks reported Q3 2018 revenue of $60.5 million, compared with $62.0 million in third quarter 2017. GAAP gross margin of 78.5 percent, non-GAAP gross margin of 78.8 percent. There was a GAAP net loss of $1.8 million, or $0.02 per share, non-GAAP net income of $2.3 million, or $0.03 per share. “We delivered a solid third quarter achieving revenue of $60.5 million, which exceeded the high-end of our guidance range. 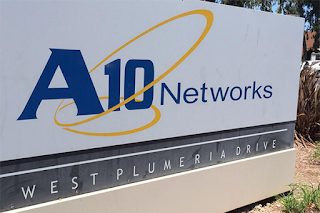 In the quarter, we continued to execute on our initiatives to transform our sales team, sharpen our focus on execution and expand our advanced suite of 5G, security and cloud solutions, and we are pleased with the initial results of our efforts,” said Lee Chen, president and chief executive officer of A10 Networks. 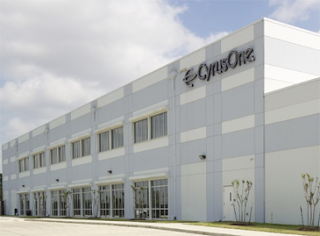 CyrusOne reported revenue was $206.6 million for the third quarter, compared to $175.3 million for the same period in 2017, an increase of 18%. The increase in revenue was driven primarily by a 26% increase in occupied CSF and additional interconnection services. Net loss was $(42.4) million for the third quarter, compared to net loss of $(55.1) million in the same period in 2017. 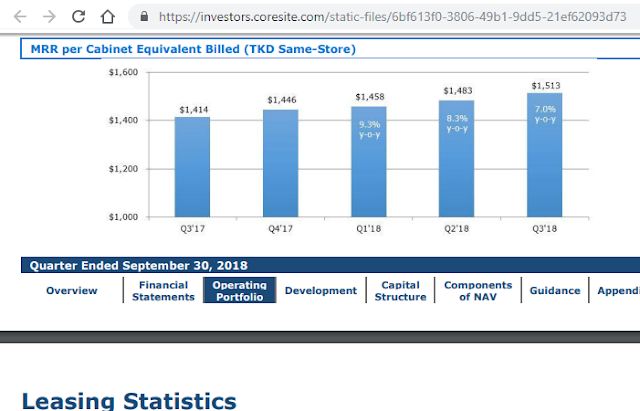 Net loss for the third quarter included a $(36.6) million unrealized loss on the company’s equity investment in GDS Holdings Limited (“GDS”), a leading data center provider in China, due to a decrease in GDS’s share price during the quarter. 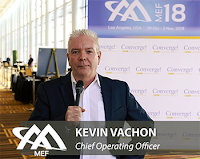 Kevin Vachon, COO of MEF, previews the workshops, the LSO hackathon, an enterprise WAN session, and Proof-of-Concept demonstrations underway this week in Los Angeles. Telia Carrier achieved real-time transmission of 600 Gbps wavelengths in its live production network from Palo Alto to San Francisco using Infinera’s FlexILS flexible grid open line system. Infinera said this milestone was achieved with the latest generation of the Infinera Infinite Capacity Engine, ICE5, demonstrating its continued rapid cadence in the development of vertically integrated optical engines with industry-leading optical performance and economics. The ICE5 600G technology, including 64 QAM (quadrature amplitude modulation) and 69 gigabaud operation, also sets the foundation for the next generation, ICE6, which is on track to deliver 800G. Infinera plans to deliver commercial products capable of 600G per wavelength in early 2019. Fujitsu Network Communications is launching a MicroApplications Practice to help network operators transform their software approach, allowing faster and more cost-effective solutions for networking challenges. The idea is to help network operators to evolve from monolithic software stacks to container-based, modular pieces of code based on microservices architecture. This agile approach allows flexible, automated applications to be developed for specific functions and deployed quickly, reducing time to market and increasing scalability across the cloud on a global level, while using fewer hardware resources for greater cost-efficiency. Fujitsu said its MicroApplications Practice leverages the benefits of microservices architecture with a collaborative approach for developing applications tailored to a provider’s unique needs. In some cases, a single microservice is sufficient to address a particular need. For other circumstances, a more robust MicroApplication is required. Microservices — Fujitsu microservices are standalone, container-based, single-function software modules designed to speed development cycles to meet today’s networking challenges. Each service is developed, tested and scaled independently to optimize its performance. MicroApplications — MicroApplications are pre-packaged microservices, bundled with workflow automation and application programming interface (API) integration tailored to a customer’s ecosystem. Fujitsu MicroApplications also include a user interface to address the functions required to administer the solution. Warrior Framework — Fujitsu’s open-source automation framework enables the flexible development and deployment of MicroApplications. In addition to a basic framework for administration and configuration of applications, it includes an extensive library of pre-developed scripts to speed development, as well as a robust set of networking protocol support. Network Services — Fujitsu offers a full suite of services for MicroApplications, including design and build, multivendor integration, deployment, and maintenance and support, using a consultative approach to develop the use cases and define the requirements. After deployment, Fujitsu provides software configuration and lifecycle management services as well as technical support and NOC services. "Through the power of collaboration and advanced, open-source digital technologies, Fujitsu delivers the most effective MicroApplications solutions for each unique customer challenge," said Rod Naphan, chief technology officer at Fujitsu Network Communications, Inc. "Our MicroApplications Practice provides network operators a simplified path to more efficient network operations and increased service agility." 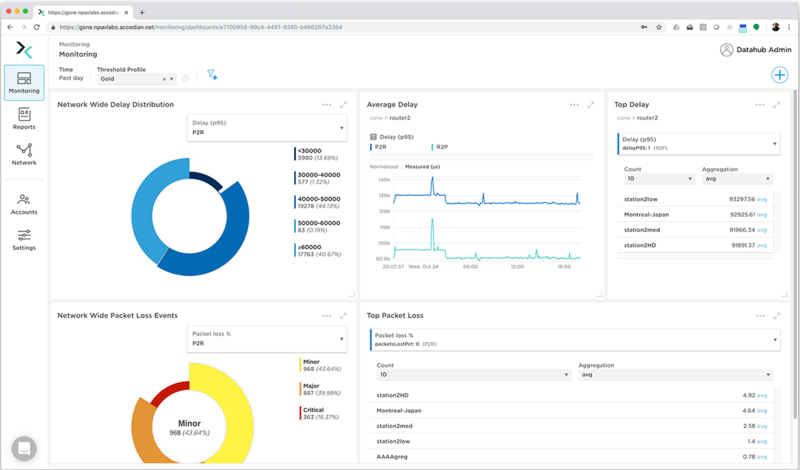 Specifically, this solution works together when the Trend Micro VNFS executes on “docomo 5G open cloud.” Then the security threats hidden in traffic of various services executed on the cloud are visualized, detected, and ultimately blocked by Trend Micro. This provides a secure 5G environment to users and protects against IoT devices that don’t incorporate additional security. Fujitsu and Ericsson announced a partnership to deliver end-to-end 5G network solutions and related services initially in Japan and later expanding globally. The two companies said they will join forces to develop this based on their combined portfolios – spanning radio access and core network – for the dynamic 5G market in Japan, connecting communications service providers to the global 5G ecosystem. Accedian introduced its service analytics solution, SkyLIGHT DataHUB IQ, for providing network and IT operations teams a single, unified view of how their network is behaving and how subscribers are experiencing the network, enabling the prioritization of the most severe customer-impacting issues for immediate resolution. Accedian said its software can provide full stack views into service availability and performance—in real time and in context. DataHUB IQ combines and correlates highly granular active and passive monitoring metrics from the SkyLIGHT portfolio with network data from other vendors and sources. Machine learning capabilities are used to detect anomalies from baseline performance, to provide insight into network behavior and issues, and to predict future network issues before they occur. 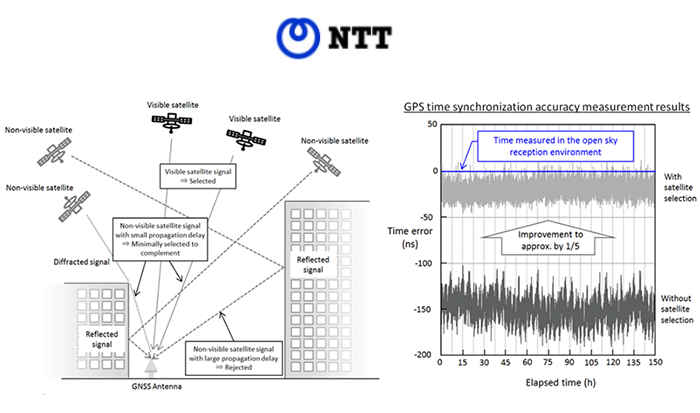 This real-time, contextual insight can be used to automate the performance of virtual and hybrid networks, particularly for closed-loop automation and self-healing networks. Accedian and Colt will take part in a live demonstration of the platform during the Service Assurance Proof of Concept showcase at MEF18. The demonstration will show how SkyLIGHT DataHUB IQ leverages machine learning and artificial intelligence to detect service issues and then dynamically adjust MEF 3.0 service parameters in a closed-loop system—across domains, between vendors, and using open APIs aligned with MEF LSO standards. Red Hat reported revenue of $823 million, up 14% in USD year-over-year, for its second quarter of fiscal year 2019 ended August 31, 2018. GAAP operating income for the quarter was $135 million. Non-GAAP operating income for the second quarter was $197 million, up 3% year-over-year. For the second quarter, GAAP operating margin was 16.4% and non-GAAP operating margin was 23.9%. Subscription revenue from Infrastructure-related offerings for the quarter was $527 million, an increase of 8% in USD year-over-year, or 8% measured in constant currency. Subscription revenue from Application Development-related and other emerging technology offerings for the quarter was $196 million, an increase of 31% in USD year-over-year, or 31% measured in constant currency. Red Hat OpenStack Platform 13, the newest version of Red Hat’s cloud Infrastructure-as-a-Service (IaaS) solution provides the capability to containerize all OpenStack services, including networking and storage, for the first time in a Red Hat OpenStack offering. Red Hat OpenShift Container Platform helps Red Hat OpenStack Platform 13 serve as an extensible platform for cloud-native workloads, providing a single architecture that brings the power of Linux containers on Kubernetes orchestration to scalable OpenStack infrastructure. Fast Forward upgrades -- gives customers the option to stay on a faster upgrade path and receive new features from the upstream community every six months, or remain on a supported release for a longer period of time. Integration of security related projects such as OpenStack Barbican, providing tenant level lifecycle management of secrets, such as passwords, security certificates and keys. With the introduction of Barbican, encryption related use cases are now available, such as Cinder encrypted volume support, Glance image signing and Swift object encryption. Increased TLS coverage for internal communication flows for services such as VNC, OpenDaylight and Redis. The introduction of these features can enable customers to better comply with security standards such as FedRAMP, SecNumCloud, and other industry specific risk management frameworks. IBM will extend its private cloud platforms (IBM Cloud Private and IBM Cloud Private for Data) and its middleware offerings to Red Hat OpenShift Container Platform as Red Hat Certified Containers. The agreement builds on IBM’s recent move to re-engineer its entire software portfolio with containers, including WebSphere, MQ Series and Db2. The companies said there is growing consensus that container technologies are the best way to move applications across multiple IT footprints, from existing data centers to the public cloud and vice versa. 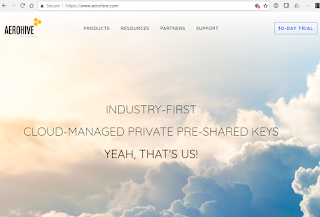 Under their agreement, enterprise customers will be able to more easily adopt a hybrid cloud strategy with IBM Cloud Private and Red Hat OpenShift serving as the common foundation. This will enable the IBM Cloud Private container platform to provide a single view of all enterprise data. 5G Americas, which is an industry trade association, published a 271-page whitepaper detailing the extensive standards work by 3GPP in the development of 5G wireless technology. 3GPP Release 14, which was frozen by mid-2017, produced LTE-Advanced Pro features. It also focused on the study items towards 5G mobile wireless technology and architecture including Cellular Vehicle to Everything (C-V2X) communications. 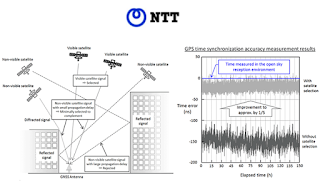 3GPP Release 15, the first phase of normative specifications for 5G, provided specifications for a wider range of spectrum bands, from below 6 GHz to millimeter (mm) Wave bands up to 100 GHz enabled by a New Radio (NR) access technology. 3GPP Rel-15 Non-Standalone 5G New Radio (NSA 5G NR) specifications were completed in December 2017. The 5G NSA specifications have an LTE anchor for the control plane communications with a 5G NR cell to boost user data. The Rel-15 Standalone 5G NR specification will work without any reliance on LTE and those specifications were completed in June 2018 along with specifications of the new core network. The new core network specified in Rel-15 will provide interaction with the Evolved Packet Core (EPC) 4G system with orchestration, virtualization, a clearly separate control and user plane, and signaling architecture. Network slicing and Service Level Agreement (SLA) for groups of devices of new vertical industries and services will be provided for by the 5G core specification. 3GPP Release 16 definition of work study items was completed on schedule in July 2018. 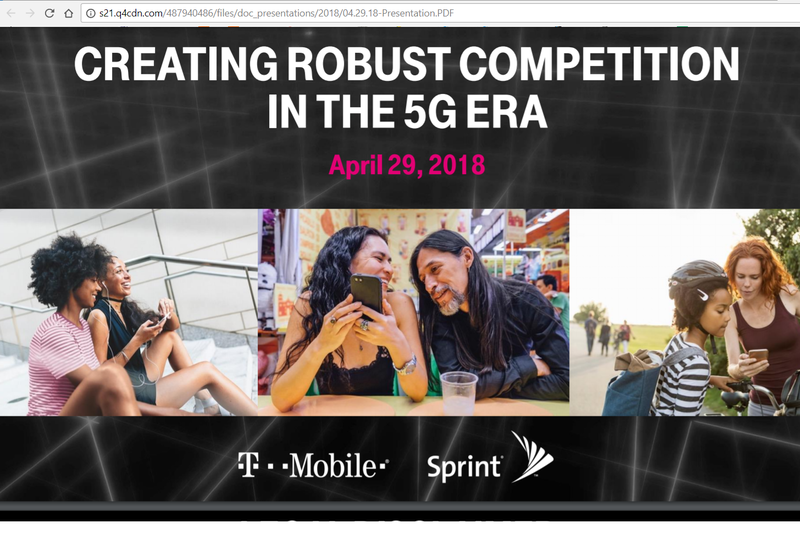 Release 16, described as phase 2 of 5G, will primarily address any outstanding issues in Rel-15, expansion of 5G NR based on C-V2X capabilities, Industrial Internet of Things (IoT), enhancements to Ultra-Reliable Low Latency Communication (URLLC), and 5G in operation in unlicensed spectrum and above 52.6 GHz. 5G efficiency improvements in Rel-16 will include enhancements to 5G Self-Organizing Networks (SON) and Big Data capabilities, MIMO enhancements, improved power consumption, support for device capabilities exchange, and a study of support for non-orthogonal multiple-access (NOMA). The Release 16 standards will be completed before the end of 2019 to target the ITU IMT-2020 submission. Michael Recchione, Principle Engineer, Mobility CTO Group, Cisco and leader of the 5G Americas working group, explained, "We are looking upon a newly defined era in mobile technology. 3GPP Release 15 marks the start of that new 5G era, the new horizon technology enablers for the Internet of Things, autonomous vehicles and ultra-reliable low latency communications that will enable connectivity previously unimaginable." 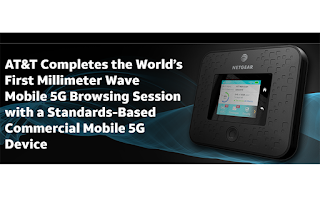 AT&T took another step toward 5G with completion of the first millimeter wave mobile 5G browsing session. The test used NETGEAR Nighthawk 5G Mobile Hotspot and was occurred in Waco, Texas over network infrastructure from Ericsson. 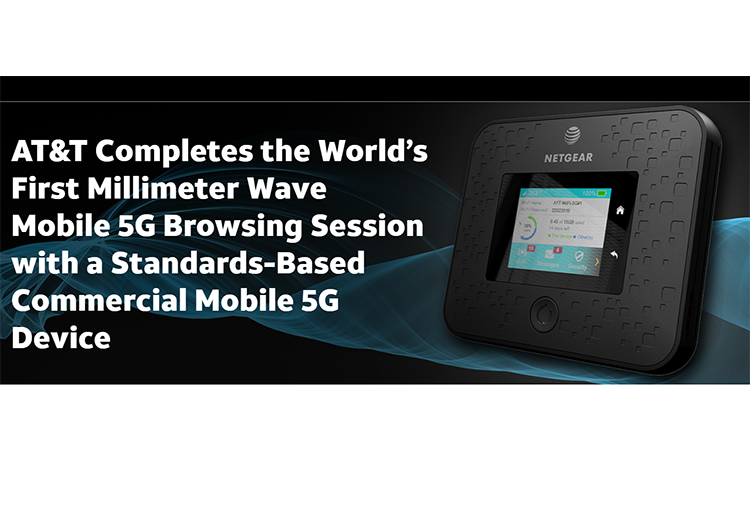 This is the first standards-based mobile 5G device in the world able to access a live millimeter wave 5G network. “This proves we are well on our way to the promise of mobile 5G for consumers,” stated David Christopher, president, AT&T Mobility and Entertainment. AT&T plans to launch 5G in at least 12 cities this year and 19 cities in early 2019. Samsung will participate in India’s first large-scale 5G trial, scheduled to take place in the first quarter of 2019, in collaboration with the Department of Telecommunications (DoT). Samsung is showcasing 5G at this week's India Mobile Congress 2018 in New Delhi. Demos include 5G home broadband services, Smart Cities and Smart Agriculture. Samsung’s 5G Skyship, which was developed in partnership with Korea Telecom, will be flying over the exhibition center to demonstrate first response use cases. Samsung notes that it built the world’s largest greenfield and the most advanced 4G LTE networks nationwide by partnering with Reliance Jio, covering 99% of the Indian population, equivalent to 1.3 billion people. 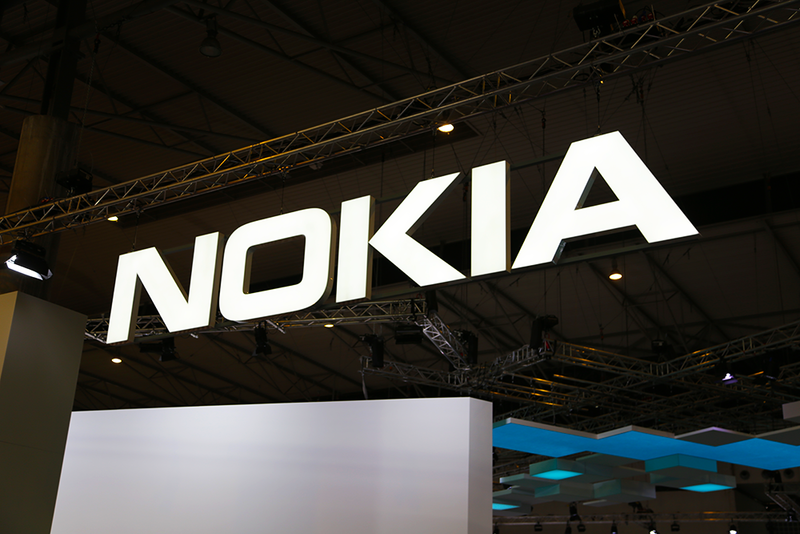 Nokia has started manufacturing 5G New Radios (NR) based on the 3GPP 5G New Radio Release 15 standard at its state-of-the-art plant in Chennai. Nokia's Chennai facility, which is one of the largest telecom equipment manufacturing plant in the country, recently reached the 4 million unit annual production milestone of 2G, 3G and 4G units. It serves both domestic as well as global customers, shipping to over 100 countries. Sanjay Malik, senior vice president and head of the India Market, at Nokia, said, "This is another big leap towards the 'Make in India' vision as our factory continues to contribute to the Indian economy and the country's growing profile as a manufacturing and engineering hub. Nokia was the first to leverage the skills and capabilities in India and start manufacturing telecom networks equipments in the country in 2008, and developthe local supply chain for various components. We are now pioneering 5G manufacturing in the country, making India and the world ready for 5G." Bharat Sanchar Nigam Limited (BSNL) selected Nokia to supply, install, commission and maintain the Smart Telecom Poles across India in all of BSNL's telecom circles. The project envisions a transformation of India's cities through intelligent infrastructure. Huawei, which has deployed more than 380 NFVI projects, launched an Intel Select Solution in NFVI. Intel Select Solutions for network functions virtualization infrastructure (NFVI) are workload-optimized network solutions designed to simplify the process of selecting and deploying the hardware and software needed for network workloads and applications. Dan Rodriguez, vice president of Communications Infrastructure Division, Data Center Group, Intel said: "Intel® Select Solutions provide optimized, pre-integrated, and fully verified reference designs so that users can simplify and accelerate adoption and deployment of trusted solutions. Huawei's FusionSphere for NFVI solution enables end users to efficiently implement virtualized network functions and application deployment, achieving flexibility, reliability, performance and ease of maintenance at optimal cost while extracting the maximum benefit from the Intel® Xeon® Scalable platforms." Amazon Web Services (AWS) generated $6.679 billion in revenue in Q3 2018, up 46% compared to a year ago. The business unit achieved operating income of $2.077 billion for the quarter, up 77% compared to year ago. The annualized run rate is now above $26 billion. Operating margin for AWS was 31%, while capital leases for data centers were up 9% yoy. AWS will open an infrastructure region in South Africa in the first half of 2020. The new AWS Africa (Cape Town) Region will consist of three Availability Zones. New customer commitments and major migrations during the quarter: DoorDash is all-in on AWS; Hubspot and Samsung Heavy Industries selected AWS as their Preferred Public Cloud Provider; and Yelp moved its master database from its own data center to AWS, completing its migration to the AWS cloud. AWS announced a multi-year, global agreement to build a new multi-billion dollar DXC to deliver IT migration, application transformation, and business innovation to global Fortune 1000 clients. AWS announced the general availability of new High Memory instances for Amazon Elastic Compute Cloud (Amazon EC2) for large in-memory databases, including production deployments of SAP HANA. AWS announced the general availability of T3 instances, the next generation of burstable general-purpose instances for Amazon EC2. AWS announced general availability of a high frequency instance (z1d) for Amazon EC2, as well as the next generation of memory optimized instances (R5), and memory optimized instances with local storage (R5d). AWS announced the general availability of Amazon Aurora Serverless, a new deployment option for Amazon Aurora that automatically starts, scales, and shuts down database capacity with per-second billing for applications with less predictable usage patterns. AWS announced Amazon Relational Database Service (Amazon RDS) on VMware. CoreSite Realty reported total operating revenues of $139.2 million for Q3 2018, a 13.1% increase year over year. Third-quarter net income per diluted share was $0.52, a 13.0% increase year over year. Data center lease commencements totaled 36,576 NRSF at a weighted average GAAP rental rate of $160 per NRSF, which represents $5.9 million of annualized GAAP rent. CoreSite’s renewal leases signed in the third quarter totaled $16.2 million in annualized GAAP rent, comprised of 97,682 NRSF at a weighted-average GAAP rental rate of $166 per NRSF, a 3.2% increase in rent on a cash basis and a 5.8% increase on a GAAP basis. The third-quarter rental churn rate was 2.5%. As a result of renewals and growth in interconnection and power revenues, monthly recurring revenue per cabinet equivalent increased 7.0% over the prior-year period. As of September 30, 2018, CoreSite had a total of 160,591 square feet of turn-key data center capacity under construction and had spent $100.7 million of the estimated $281.8 million required to complete the projects. 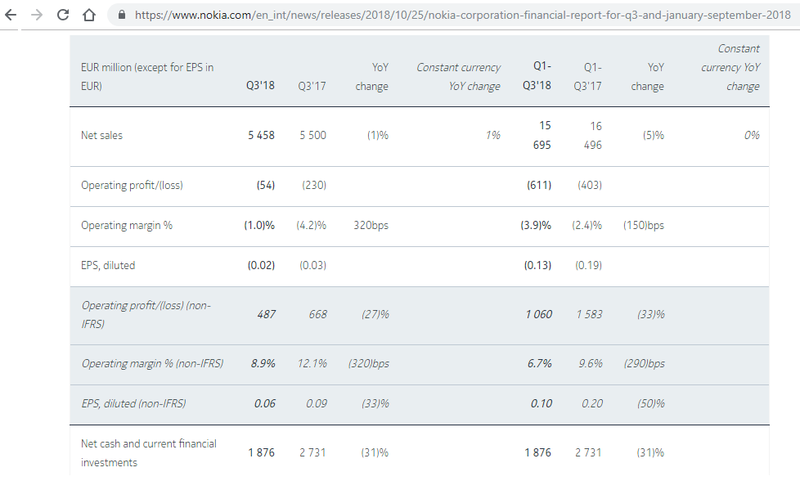 Nokia announced a corporate realignment and cost cutting program aimed at refocusing its efforts on high-performance, end-to-end networks, expansion into new enterprise segments, building a standalone software business, and generating significant licensing revenues. Nokia said the cost cutting will entail a net reduction of employees globally but did not disclose the size of the expected cuts. Intel reported record third-quarter revenue of $19.2 billion, up 19 percent YoY. The PC-centric business (CCG) delivered record revenue, up 16 percent. The data-centric businesses grew 22 percent YoY led by 26 percent growth in the Data Center Group (DCG). DCG achieved record quarterly revenue driven by strong demand from cloud and communications service providers investing to meet the explosive demand for data and to improve the performance of data-intensive workloads like artificial intelligence. In Q3, DCG shipped the first Intel Optane™ DC Persistent Memory for revenue, and Intel® Xeon® Scalable set 95 new performance world records2 as adoption continued. The Internet of Things Group (IOTG) also achieved record revenue. 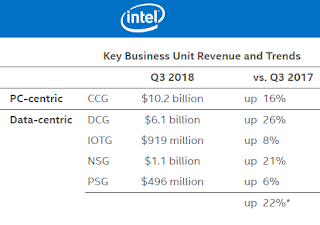 Excluding Wind River, which Intel divested in the second quarter, IOTG revenue was up 19 percent YoY on broad business strength. Record revenue in Intel's memory business (NSG) was up 21 percent YoY. 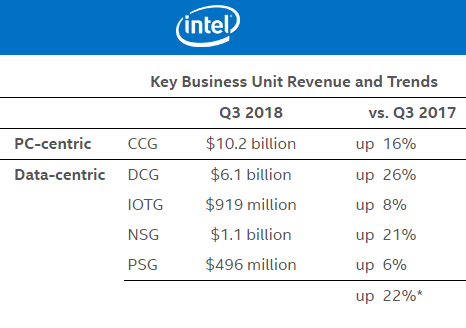 Intel's Programmable Solutions Group (PSG) revenue grew 6 percent YoY with continued strength in the data center and strong organic growth. PSG expanded its product line with the acquisition of eASIC and the introduction of the new Intel® Programmable Acceleration Card (PAC) with Intel® Stratix 10 SX FPGA. Mobileye also achieved record quarterly revenue of $191 million, up approximately 50 percent YoY3 as customer momentum continued. Mobileye won 8 new design at major US and global automakers in Q3, bringing its year-to-date design win total to 20. Nokia reported net sales of EUR 5.5 billion for Q3 2018, compared to EUR 5.5 billion in Q3 2017. On a constant currency basis, reported net sales grew by 1% year on year. 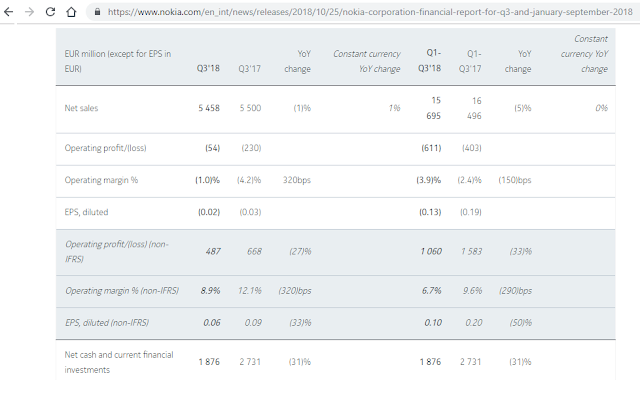 Nokia achieved year-on-year growth across all five of its Networks business groups, as well as in Nokia Technologies. "Nokia's third-quarter results validate our earlier view that conditions would improve in the second half of 2018. This was particularly evident in our excellent momentum in orders, growth across all five of our Networks business groups, and improved profitability compared to the first half of the year. Despite some risks related to short-term delays in project timing and product deliveries, we remain on track to deliver on our full-year guidance," stated Rajeev Suri, Nokia's President and CEO. Regarding its Networks business, Nokia said its order backlog was strong at the end of Q3 2018, and that it continues to expect commercial 5G network deployments to begin near the end of 2018. 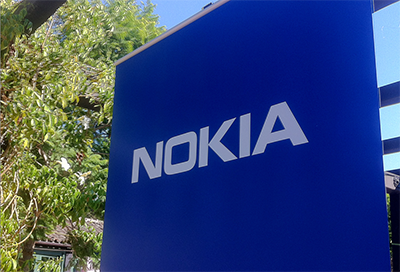 Nokia Technologies posted a 19% year-on-year growth in recurring licensing net sales. A decrease in net sales on a year-on-year basis was primarily due to the absence of approximately EUR 180 million of non-recurring catch-up licensing net sales, which benefitted the year-ago period.